3D Localization Configurator is a standalone application used to generate configuration file for Photoneo 3D Localization SDK. The configuration file contains the CAD of the searched object, defined gripping point and the localization parameters. 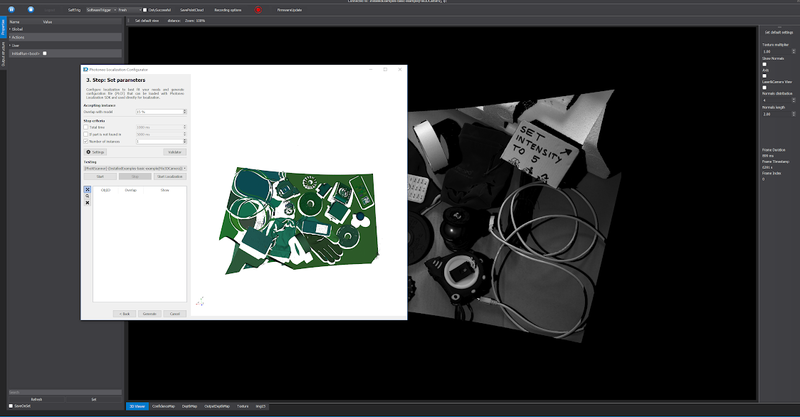 Localization Configurator requires PhoXi Control Application to connect to 3D scanner or file camera. Copy the example directory outside the Program Files directory (because of the user rights) and use CMake to generate the project. The gripping point defines the point where the object should be picked by the gripper. Every gripper has a defined tool point. Gripping point and tool point together define the mutual position of the gripper and gripped object for bin picking applications. In Localization Configurator, the gripping point has a position and orientation with respect to CAD model coordinate system. When the localization process finds the object, it returns the position and orientation of this gripping point (usually in robot coordinate space). This constrain can be combined with "Number of instances"
This constrain can be combined with "Amount of time"
First, open the PRAW file in PhoXiControl either by dragging and dropping the PRAW file into the PhoXiControl window or by directly opening the PRAW file with PhoXiControl. After this has been done, the Localization Configurator will have the option of using the File Camera of the PRAW file as the source scene in the localization. First the algorithm splits the scene into segments. Segment should be a continuous meaningful area in the scan. In the visualizer each segment has different shade of green color. When there are multiple objects in the scene, each object should have different shade of green. It does not matter when the object is split into several segments. There are 3 advanced parameters affecting the segmentation. The nominal number of points in a segment. Smaller segments are filtered out (gray color). The nominal number of points in a segment. Bigger segments are filtered out (gray color). The matching algorithm advanced parameter has 3 possible settings. Surfaces is a useful setting in case the object has definite depth and indefinite edges and/or a rugged surface. Combined is a useful setting in case the object is approximately planar and has clear edges (i.e. it is not rounded). The density of model subsampling. Higher density means more points and more extensive computations. For combined matching algorithm the dense option is not so heavy on the computation and might bring better results. The algorithm works on searching around numerous key points in the scene. This parameter sets the radius for searching. For specific situations, it might speed up or slow down the search, but should not significantly affect whether the object is localized or not. There are 3 advanced parameters affecting the tolerance of matching to noise and accuracy of the fit. This parameter is related to the segmentation. This parameter, expressed as a percentage of object surface from a specific viewpoint, defines the minimal segment size that is considered relevant for matching with the object (smaller segments will be considered irrelevant for localizing the object). This parameter is defined as the percentage of the segment which is allowed to overflow the fitted object (the percentage is calculated from the size of the segment). This parameter is defined as the percentage of all segments which is allowed to overflow the fitted object (the percentage is calculated from the sum of segment sizes). There are 3 advanced parameters affecting the fine alignment algorithm. 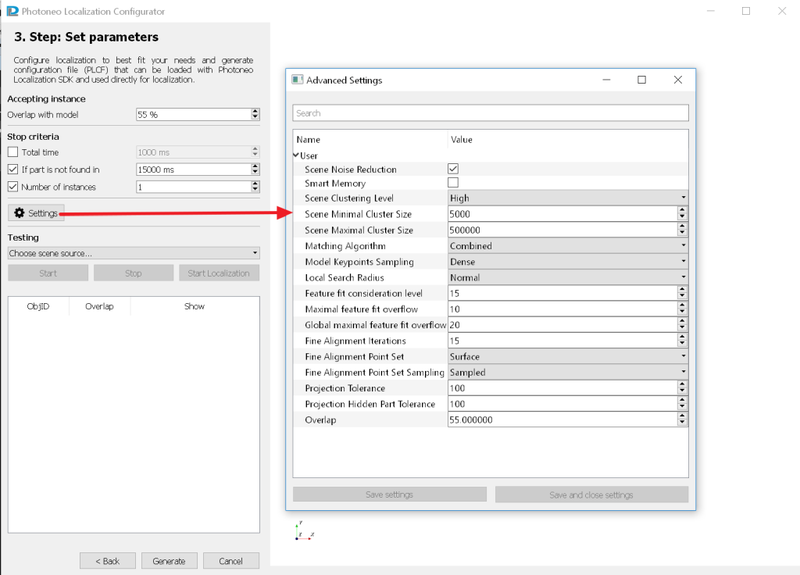 This parameter has two possible settings either Surface or Edge points. Edge points might be more useful for planar and rectangular objects, but commonly remains on the Surface setting. Projection Tolerance and Projection Hidden Part Tolerance - percentages, usually set to 100 %, which means it is turned off. Imagine scanning a thin L shaped object and scanning it directly from the top, therefore one side can be seen almost completely (except the shadows), but from the other side only the edge can be seen. In this case the localization might find the object flipped because it relies on the side that is visible and few points on the edge are irrelevant. By setting this tolerance parameter to lower percentage, e.g. 10 - 45 % the localization will consider shadowing of the object on itself and further indicators to find correct "flip" of the part. This parameter is identical to the parameter Overlap with model in the main application window. After the algorithm finds the object in the scene, it calculates number of points that fit on the CAD model. The model is "covered" with the 3D points only to some extent and this coverage we call overlap. When the overlap is lower than specified number, the fitted object is discarded by the algorithm. 3D visualiser helps to test the localization parameters on specific object. It displays the 3D point cloud acquired from 3D scanner or file camera via PhoXi Control Application. After starting the localization process, the CAD models of found object are drawn into the point cloud. The color of object indicates whether the object is occluded (blue color) or not occluded (gold color). Gold objects are the most suitable to pick. This page was last modified on 26 July 2018, at 16:20.